Sliders are produced in various sizes to fit body-armour, outer-garments and shirts, with rank structures. Corporate identity patches in conjunction with, if required, individual naming, lettering and sequential numbering can also be supplied. The corporate identity patches are generally a combination of embossed and flat print to achieve finite design detail. The background material can be our standard stiffness providing permanently crisp and smart appearance without the need of ironing after washing, or a softer finish to form to the contours of the shoulder if a lesser military appearance is required. 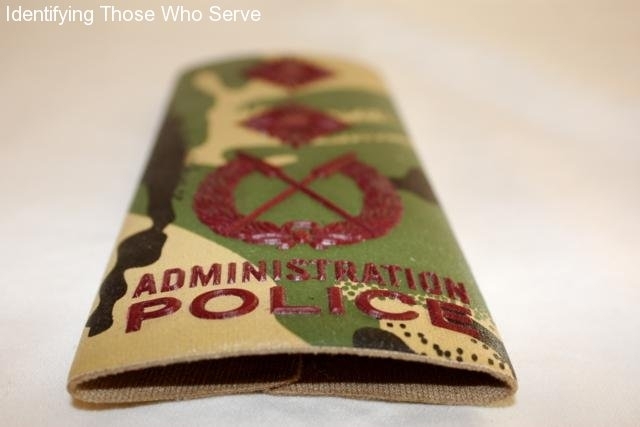 Senior Officers often prefer traditional hand embroidered gold or silver wire rank insignia and we provide this service applied to embossed sliders.